Memories from my early polio years are pretty vague so I do have to work at retrieving them. However with the 60th anniversary of the vaccine introduction to Canada coming up in 2015 I do feel it is important to log some of this before the first hand experience disappears forever. Particularly right now with what appears to be the growing reemergence of this devastating disease. I work on retrieving these memories through information gleaned from conversations with my mother. i also spend time in the evening meditating with my talk-to-text recorder in hand. As a memory solidifies I record a couple of lines so I have a mnemonic to work with later. I hope this clarifies some of the questions I have had regarding my memories from such a young age. So it was that following my spinal tap I was immediately admitted to hospital. The fear of polio was so high at the time everyone diagnosed automatically went into an isolation unit. The numbers had grown so high that a whole hospital became the isolation unit. In Winnipeg that hospital became the King George Hospital and the central hub for polio treatment. Now this is from Google and not my memory. In early 1951 there were three cases of polio in the King George and all had respiratory paralysis. All three died. Nine months later that number had increased to 75. In 1952 those number climbed to 150 and in 1953 the numbers grow past 2000. They will never be 100% accurate due to the potential for undiagnosed cases from the farming communities. Polio was never diagnosed without a spinal tap and they weren’t done unless there were signs of paralysis. Many of these cases went undiagnosed, in part, because the symptoms looked a lot like the flu and didn’t always result in any form of initial paralysis. Many cases that went undiagnosed were identified much later with the onset of post polio syndrome but that wouldn’t happen for another forty years. My memories of the hospital are scattered. I do remember I was in a dormitory type unit. The numbers were to great to even consider four or six bed units. It was like a hive and there was a constant buzz of activities. Besides the sound of the iron lungs in motion there were constant sound of sobs, crying and, with some of the older kids, friendly chatter. And since family were not able to visit this environment became your world. My mother to this days expresses feelings of guilt over not having been able to get in to see me for the first four weeks I was there. But that was true of every other child there so the other sound that was constant was that of the nurses soothing a distraught child. There were also continual whisperings among the nurses regarding a wide variety of issues on the unit. What I do remember is the rows of iron lungs. 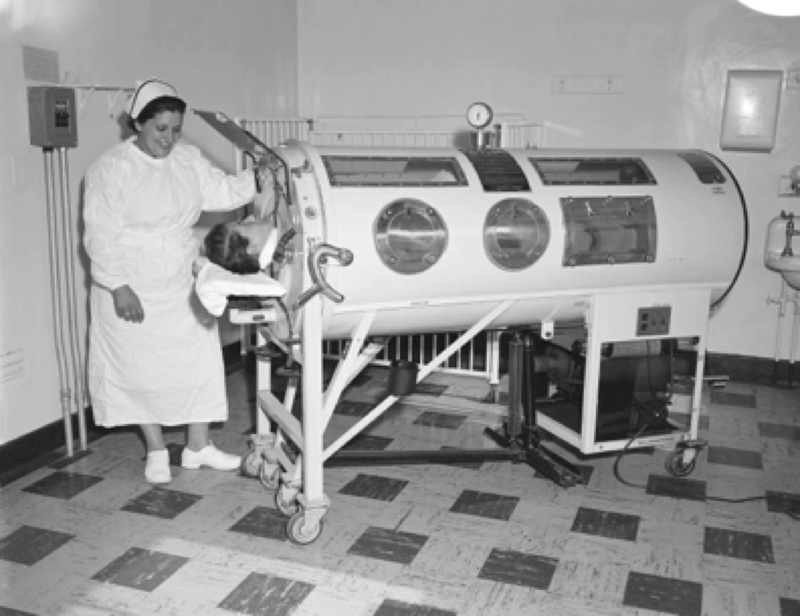 If you showed signs of respiratory distress you went into an iron lung. Now these were big machines for such small bodies and all that was outside the machine was ones head. Inside this machine was a large bellow like apparatus that would create a negative pressure effect to keep a person breathing. Technology has come a long way but there are still people dependent on these antiquated pieces of technology. The numbers are difficult to find however in 2004 there were a reported 39 people in North America still dependent on these machines. We really have no way of knowing about third world countries. Sippy cups took on a whole new meaning then which is different since nobody knew what a Sippy cup was then. They were little more than miniature metal teapots. You seldom received hot beverages due to the heat convection along the metal spout. Nurses, very different from the walking degrees we see today, had a pattern and would feed us in a rotation. 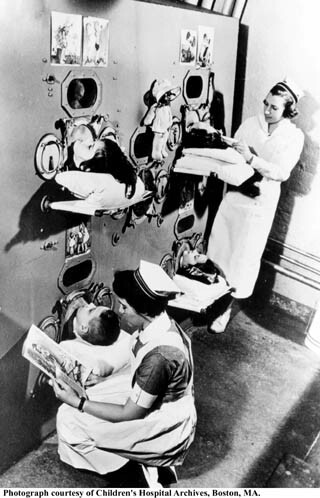 Again the numbers were to high to really have iron lungs spread all over, thus the iron lung pod. These were designed in a such a way that the staff could enter them like a small room and attend to the physical needs of all four kids in the lung. The numbers were to high to have full iron lungs all over thus the pod! I do remember having to establish your swallowing to time with the chest pump. If you tried to swallow during the wrong cycle of the pump you would choke. It became a team effort between you and the nurse to time the eating properly. The nurse had to be alert enough to know when to put the spoonful of food into your mouth and you had to know when to swallow. This made you very dependent on the nurse and, in hindsight, required a level of blind trust. After all at 3 years old you don’t make conscious decisions about things like trust, you just do. Another memory that jumps out at me now but meant very little at the time was the number of children who were taken off the ward and never returned. I don’t recall giving it any thought but it was a daily event to have someone taken out on a gurney covered with a sheet. I do remember some of the nurses would just say they were playing hide and seek. But the harsh reality was that these kids had died. But again at 3 years old death meant very little. It wasn’t until later in my life, during my time in the Alberta Children’s Hospital that death took on more meaning. But then people die in hospitals everyday and that is just a fact of life. It may not be one most people really want to look at but it is reality. Hospitals are not a TV drama show where everything comes to a successful conclusion at the end of the hour. The deaths did slow. What had been a daily event in Winnipeg became a rare event in the Alberta Children’s Hospital. I do know, very vividly, that between the time I was 8 and 12 I had lost four good friends in that hospital. Compare to the stats in the King George that was minimal. However with age came awareness so those deaths at the Children’s had more of an impact. But that’s a story for another time. Fortunately for me I was only in an iron lung for two weeks before they decided I could breathe sufficiently on my own. Polio was a weird disease. You never know what level of physical impairment would be left until the virus had run its course. I have polio friends from back in those days that walk with a limb while others still need breathing assistance as well as the use of a wheelchair. I had one good friend who could do everything except swallow. She used no ambulatory devices but had to tube feed herself all of her life. I have no idea where she is today. We lost touch in the late 60’s. Having these memories has really spurred on my desire to do this little project. The idea that something as simple as a vaccination can keep this type of event from happening again motivates me. With polio starting to raise its head in little pockets needlessly I believe people need to be made aware of the ramifications to everyone in our society. Another polio outbreak can be and should be avoided. People may find pictures of cute little poster children uplifting but they tend to ignore the pages and pages of obituaries. Vaccine, don’t generate. Polio is avoidable! This entry was posted in Disability, Personal Life and tagged disability management, independent living, Just one man's opinion, polio, Polio diary, Rotary International, Terry Wiens, vaccinations. Bookmark the permalink. Thanks for your commentary, Terry.